Its no secrete that Funding for Science in Australia, and around the world (see refs below), is in decline. The result is lower and lower success rates. While we wait for the #NHMRC to release the outcomes for 2015, the word on the street is that we can expect only 10-12% of grants to be successful. In other words, for 90% of Australia’s researchers they are wasting ~3 months of the year for nothing. Consequently as the funding pool decreases, funds naturally flow towards ‘sure bet’ senior researchers. This means that this wasted time is felt the hardest by early- and mid- career researchers (#EMCRs) who cannot compete with the long CVs of their senior peers, and are seen as a potential risky investment. Below is a graph I put together from the 2013 data, which is the most up to date information currently at hand. This trend of funding more senior researchers is clearly seen in the massive increase in average age of the CIA (chief investigator) on project grants over the past 30 years. It used to peak around 40 years, which perfectly aligned with the drop off in fellowships. So there was a very clear and clean transition from Post-Doctoral Funding for those that wanted to transition to a team leader role. However now, the average age has shifted to >50 years. 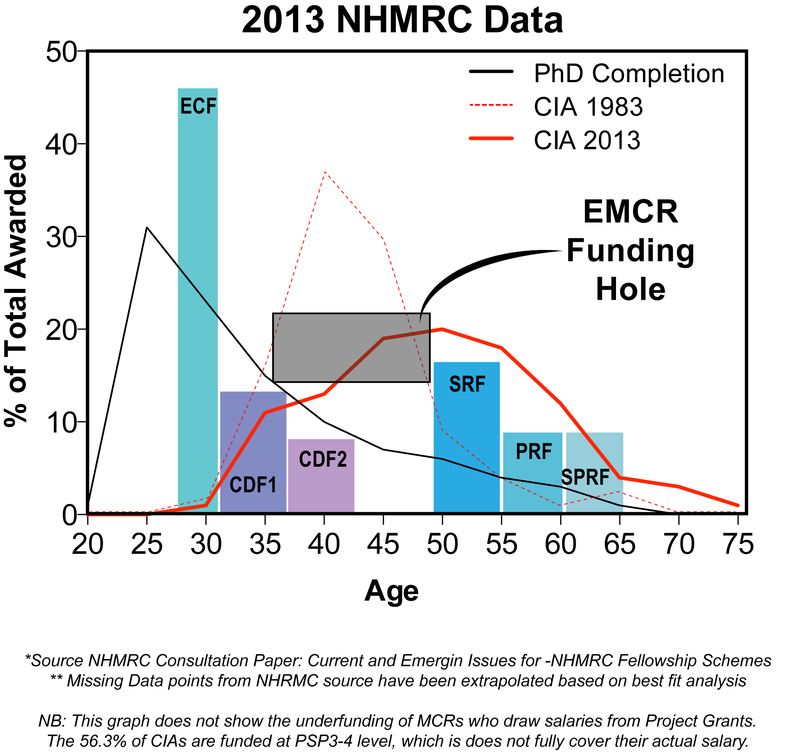 This has created a significant 10-15 year ‘Funding Hole’ for EMCRs, where there are very limited number of fellowships on offer, and little to no chance of securing a project grant. While there has been a lot of talk about this black box, no solution or action has been taken to stem the loss of young, bright and talented researchers being forced out of research. Without action soon, we run the real risk that there will be no succession plan, and Australia’s ability to remain internationally competitive will be set back decades. 1. Alberts, B., Kirschner, M. W., Tilghman, S. & Varmus, H. Rescuing US biomedical research from its systemic flaws. PNAS 111, 5773–5777 (2014). 2. Cyranoski, D., Gilbert, N., Ledford, H., Nayar, A. & Yahia, M. Education: The PhD factory. Nature 472, 276–279 (2011). 3. Committee to Review the State of Postdoctoral Experience in Scientists and Engineers et al. The Postdoctoral Experience Revisited. (National Academies Press (US), 2014). 4. Powell, K. The future of the postdoc. Nature 520, 144–147 (2015). 5. Alberts, B., Kirschner, M. W., Tilghman, S. & Varmus, H. Opinion: Addressing systemic problems in the biomedical research enterprise. Proc. Natl. Acad. Sci. U.S.A. 112, 1912–1913 (2015). This entry was posted in News and tagged ARC, EMRC, Fellowships, Funding, Garvan, MREF, MRFF, NHMRC, PhD, Project Grants, research, Science, UNSW.